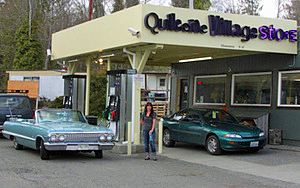 Welcome to Quilcene Village Store! Conveniently located on Highway 101 just northwest of central Quilcene, you can’t miss us! We are your best bet for gas, food, liquor, housewares, tea, coffee, snacks, fresh sandwiches and locally baked goods, all kinds of beverages, clothing, picnic, camping and outdoors supplies, wonderful gifts, chocolates and many other gourmet treats. We feature unique handmade and locally sourced items and organics whenever we can. Come check us out! We think you will enjoy your visit. To view a pop-up slideshow, click any image. Use the side arrows to move through the slideshow. Use the “X” at top left corner of the slideshow to return to this page. Yes you can buy socks in Quilcene! Right here! Plus more hiking gear for your day trips. Make your occasion special with some mixology. Clothes that you NEED when the weather turns! Pantry supplies and condiments for anything you can cook up! At a range of price points. Fine liquor and spirits. We stock all your favorites and you will find something new too! Got snacks? Gourmet jerky and all your favorite munchies. All the mags you want for your down-time. Look for the neon sign at night! Great gifts and treasured liquors for your best of friends.